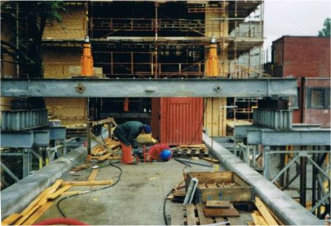 lock-nut during the lowering cycle. The units are designed so they can be removed upon completion of the jacking operation leaving just the lifting bar, base plate and lock-off assembly, they can be reinstalled at a later stage to enable lowering of the structure or de-loading of the lifting bars. Customers should use our specialist diesel or electric driven multi-flow hydraulic pumps when using these units as they provide synchronised hydraulic control of multiple sets, we also strongly recommend that you use our specialist teams to install and operate this equipment. The jacking units can also be used horizontally in conjunction with our hydra-skates to enable the movement of large heavy structures by pulling them into position, typical examples are, culvert sections, railway bridges or buildings. The hydra-skates are normally connected together using the actual pulling bar and additional lock-nuts, this distributes the pulling forces equally between the hydra-skates. 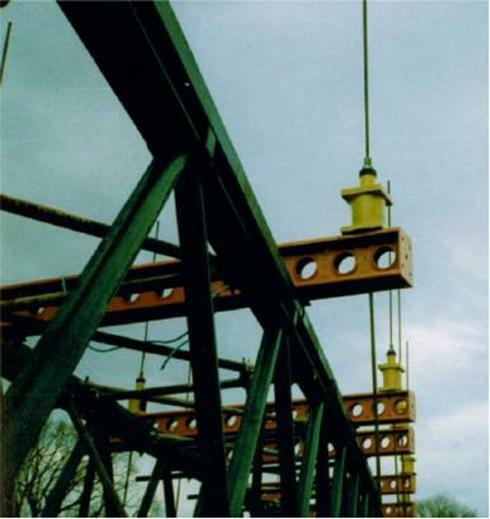 The vertical hydra-jacks are inter-linked into sets so that any variation in track levels can be compensated for by the hydraulic control system.